The railway between Preston and Blackpool North is set to reopen on Monday (April 16). 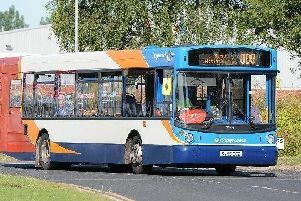 There is some good news for rail users at Blackpool after more than five months of having to rely on replacement buses. The railway between Preston and Blackpool North is set to reopen on Monday (April 16) as the transformation of train travel across the north of England continues. Train services are returnning to Blackpool - but for the first few weeks it will be at the rate of one train an hour. When the train services between Preston and Blackpool North resume on Monday, it will initially be with one train per hour allowing time for driver training on the route. Northern, the company which runs the trains, will operate one train per hour between Blackpool North and Manchester Airport – via Preston – and will continue to supplement this with two stopping and two express bus services every hour between Blackpool North and Preston. In addition to this, the hourly service between Blackpool South and Preston will continue to operate but with many services extended to operate to and from Colne. Stephen Brookes, the the rail sector champion for disabled people. And Monday will also see Virgin Trains on the west coast reinstate its direct service to Blackpool North, which departs London Euston at 4.33pm. Although welcome news, there is some disappointment that the service will only offer one train per hour. Blackpool resident Stephen Brookes, who is the rail sector champion for disabled people, said: “Of course I do welcome the return of the trains, but I was expecting four trains and hour as promised, not one. “What we are getting is not the full resumption of rail services but a reduced service which appears to be just a driver training excercise. However, Mr Brookes added that the replacement bus service had been a success. He said: “I have no issue with the buses, they are disabled-friendly and the service has been excellent. Rail users had to wait longer than expected for the service to resume, as the closure of the line was extended in March. This was due to severe weather and the breakdown of critical machinery used to install new overhead line equipment. Sharon Keith, Northern regional director, said: “We’re delighted to be able to once again start running trains between Blackpool North and Preston. “The electrification work, carried out as part of the Great North Rail Project, will enable us to run greener and more reliable electric trains from Blackpool as part of our May timetable change, giving our customers more comfortable journeys and more journey options. Michael Stewart, general manager at Virgin Trains on the west coast, said: “At Virgin Trains we’re pleased to be returning to Blackpool with our northbound service from London Euston to Blackpool North. Passengers should keep checking www.nationalrail.co.uk for the latest travel information.